We had a rough plan going into our second trip to Orlando, but, we also plan to be flexible! Today was a switcheroo, as we decided to go to a waterpark today instead of going to Hollywood Studios. In the evening we’d be meeting friends for dinner, and we just fancied a slower pace of day today. I asked online which people preferred – Blizzard Beach or Typhoon Lagoon. We didn’t get around to going to a Disney waterpark on our first trip so it was a priority for us on this trip. Typhoon Lagoon seemed to come out on top in the quick online survey I ran ^_^ and so that was the park of choice. On our first ever visit to an Orlando waterpark – Aquatica (still our favourite!) we really didn’t go prepared – a plastic bag with a towel and sun lotion was all we seemed to manage. This time though, I was on the case! For starters, I took a proper beach bag (I bought a Mickey Mouse one from Magic Kingdom last time) with essentials – towels, suncream, change of clothes (yes, I forgot things like undies last time *shame*), as well as a book to read whilst the boys went on slides! I had also bought, from the 99p Store, a small foldable cool bag, which we put frozen bottles of water in, to make sure we had cold water throughout the day – we planned on a whole day at Typhoon Lagoon, so wanted to keep hydrated! We got good use out of that cool bag, using it every day! We didn’t get to the park until 11am, thinking, as it was a Monday it wouldn’t be *too* bad, but how wrong we were – it was rammajammed! We parked eventually – not because we couldn’t find a spot, but because the cast members who were directing the cars, were not clear at all over where people should drive! On the way in, we decided to buy a refillable mug for $10.95. I knew my boy wouldn’t be able to go through the whole day without a soda, so it was good value for us. What we should have done, and which I would do next time, is bring a few snacks – $2.50 for a packet of crisps is outrageous! Whilst Steve was lining up to buy a mug, Liam and I climbed the steps to the right to have a look at Typhoon Lagoon and its famous landmark. I also took a photo of the park map so that we could figure out what we wanted to do once we’d found a spot to park ourselves for the day. We walked down and around to the left, and we could not spot a single empty space anywhere, so we carried on walking around in the hope that something would turn up. Eventually, we found some empty seats right by the side of the lagoon. There were no loungers available here, which wasn’t going to work for the whole day, I wanted to just chill out! Nonetheless, we sorted ourselves out and took claim to a few seats with our stuff. As we got up to find lockers (don’t know why we just didn’t do this on the way in to be honest!) we heard a siren and suddenly, some people in the water were swimming towards the back end of lagoon. Next thing you know a huge tidal wave came crashing down, much to our shocked amusement and screams from those in the water – of delight though, not of terror! After a few more waves, we went off to find the lockers for our valuables, and on the way, filled up our mug. 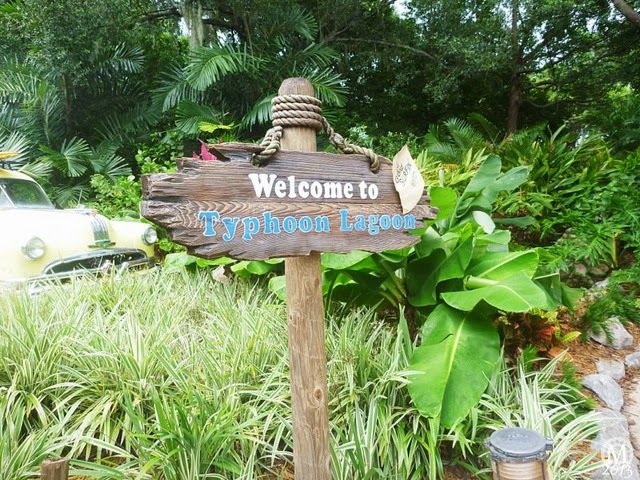 What I really loved about Typhoon Lagoon was all the lush greenery and flowers! I spent a lot of this holiday take photographs of everything I could! After stowing away our stuff, we made our way to the lazy river, and on the way discovered a much quieter section of the park. I suggested that we go around the river, which I knew circled the whole of Typhoon Lagoon. The boys would get off near to where we were, and I would carry on round to where we entered and grab some loungers and a better spot. Eventually, I parted ways from my boys whilst they went to get our stuff, and I continued around to find quieter seats. I really wanted to have a lazy day in the sun today, so wanted a lounger – I found some under an umbrella, and bagged them. Steve and Liam then rocked up with everything and we staked another claim on beach chairs! By now it was well past lunch time, and having faffed around in the morning, we hadn’t had breakfast. We decided to grab a light lunch to see us through until dinner with friends at Bahama Breeze. We walked to the nearest food stand, which was Crush Hot Dog Cart. It was also a refill station, so Liam filled up our mug. Steve had a barbecue pork sandwich with apple slices. Liam had nuggets with fries. And I had a chicken Caesar salad. The total was $28.08. All the food was fine – nothing special, but nothing bad and it filled a hole! After lunch, we headed over to the lagoon – we wanted to get caught up in the tidal wave! The lazy river at Typhoon Lagoon is looooooong, but there is lots to see, and it’s quite a nice way to spend time in a waterpark if you don’t really want to do very much other than have a lazy one! I decided I wanted to go and chill out – I was feeling the sun and wanted to get out of it for a while, so when we reached our exit, I got out and the boys continued round as they wanted to go into the lagoon again and ride the tidal wave! So, whilst they did that, I sat back and read a book…and took an obligatory feet in sand photo! They returned to me as some rain started to fall, telling me the wave was HUGE and a lot of fun – but Liam had got knocked off his feet and managed to scrape his elbow on the bottom of the pool. For some reason, the bottom of the pool is quite sharp, and I can’t figure out why they would have it this way! I cleaned his scrape up and we decided then to start calling it a day. With the rainfall, and me now having a headache, I wanted to go home, pop some tablets and feel better for meeting up with our friends. On the way to the lockers, we spotted Stitch and were first in line for a photo op! We love Stitch! Steve had mentioned that Lilo had been there earlier when he walked past. We all got ourselves changed for the drive home – I just throw a maxi dress over my cossie when we go to waterparks and get showered at home – saves the grief of finding a spare shower! We walked back out to find our car, and drove home to get ready for our night out. Now, I know we really didn’t do much at Typhoon Lagoon today – but that’s just the way the cookie crumbles sometimes! Maybe because it was so busy when we got there that we just couldn’t be bothered with lines, or maybe because all we wanted was a day at the beach, as it were. In any case, when we go back to Typhoon Lagoon, we’ll be trying out a lot more stuff! We drove the short distance from our villa to Bahama Breeze at Rolling Oaks to meet our friends. I called ahead to make a reservation as there would be seven of us dining, and a good thing too – it was pretty full up when we got there at about 7:15. Our reservation was for 7:30 and whilst waiting for our friends – Sam, Mark and the kids to turn up, the staff were happy for us to sit down and order some drinks at our table. Sam and I met whilst we both went to a blogger event – BritMums – back in June. Whilst chatting, we both learned that we were members of the same Disney forum, and both in Florida at the same time! That day we made life long friends with each other! And we were both looking forward to meeting up in Orlando. Meeting up with Sam and her family meant lots of introductions, for our husbands to meet, and for the kids to meet as well. There is always that worry isn’t there that we all wouldn’t get along as a big group, but it was like we were all life long friends, and I don’t know about Sam, but I know I was pleased! We decided to forgo starters, and went straight into mains. I had a Cuban Sandwich – ham, roast pork, salami, Swiss cheese, lettuce, tomato, pickles, hot-pressed on Cuban bread. I had this on our first trip and was looking forward to being able to eat it again! It was delish – Bahama Breeze on every visit we’ve had here (and we’ve eaten at this location 5 times now!) has been very, very good. I also order a cup of Chicken Tortilla Soup – chicken breast, fresh carrots, roasted corn and avocado in a light broth with a hint of lime, on the side. Steve had Cuban Black Bean Soup – slow-simmered and drizzled with cilantro-crema on the side of his Carnitas – slow roasted pork, sautéed with chorizo sausage, roasted corn, sweet plantains and garbanzo beans in a cumin-citrus sauce served over yellow rice. He enjoyed this, but the pork was a bit fatty he says. Liam ate yet another burger…Housemade Wood-Grilled Cheddar Burger – melted cheddar cheese, crisp pickle slices, vine-ripened tomato, shaved red onions, Bibb lettuce, toasted brioche bun. Dessert time…Piña Colada Bread Pudding – served warm with vanilla anglaise and rum-marinated pineapple for me. Compared with some of the desserts at Bahama Breeze (I’m looking at you, key lime pie!) this was quite a small portion. But it was yummy and coconutty. Steve had Rebecca’s Key Lime Pie – homemade with brown sugar crust and golden meringue. It’s a huge dessert – a double slice, so enough for two to share. Liam had a Chocolate Island – rich chocolate mousse on a fudge brownie Island in milk chocolate sauce and vanilla bean anglaise. Sadly, in this he found a small piece of plastic…I complained and they took this off the bill and gave him another one (which we took to-go). He was put off eating this so it did end up getting binned at home. I imagine it was from the container that the pud comes in, and these things happen. The restaurant dealt with the complaint swiftly and were apologetic. With everyone stuffed, we paid the bills and invited our friends back to the villa. The boys hung out in the games room, and me and the girls – Sam and her daughter – had a good natter. But first, I had to give them to the tour of the lovely villa that we called home for 3 weeks! With the kids starting to get sleepy, they made a move back to Old Key West where they were staying, and we looked forward to meeting up in the morning for breakfast…The Kitchen Sink at Beaches & Cream! Kitchen Sink at Beaches & Cream + Epcot World Showcase + Lunch at Biergarten « Coming Soon!